Rustproof your bath and add more elbow room in the shower with the Zenna Home NeverRust Double Curved Shower Curtain Rod. Made of strong, lightweight and rustproof aluminum, the rod is guaranteed for life against rust. The rod's innovative curved design provides up to 12.5-inch of additional elbow room (when extended to 72 in. ), to give any shower a more spacious feel. Use the second rod for separate shower curtains and liners, or for hanging towels. The rod's light weight and no-cut telescoping design enable easy installation in standard 60 and 72-inch tubs, as well as in spaces as small as 45-inch The screw-mounted brackets allow for secure installation into a bathroom wall. Anchors and screws are included for standard drywall mounting. Decorative covers are included to hide the screws. Step-by-step instructions make installation easy. Adjustable from 45-inch to 72 in. 72-inch Aluminum Double Adjustable Curved Shower Rod in Satin Nickel Rustproof your bath and add more elbow room in the shower with the Zenna Home NeverRust Double Curved Shower Curtain Rod. Made of strong, lightweight and rustproof aluminum, the rod is guaranteed for life against rust. The rod's innovative curved design provides up to 12.5-inch of additional elbow room (when extended to 72 in. ), to give any shower a more spacious feel. Use the second rod for separate shower curtains and liners, or for hanging towels. The rod's light weight and no-cut telescoping design enable easy installation in standard 60 and 72-inch tubs, as well as in spaces as small as 45-inch The screw-mounted brackets allow for secure installation into a bathroom wall. Anchors and screws are included for standard drywall mounting. Decorative covers are included to hide the screws. Step-by-step instructions make installation easy. 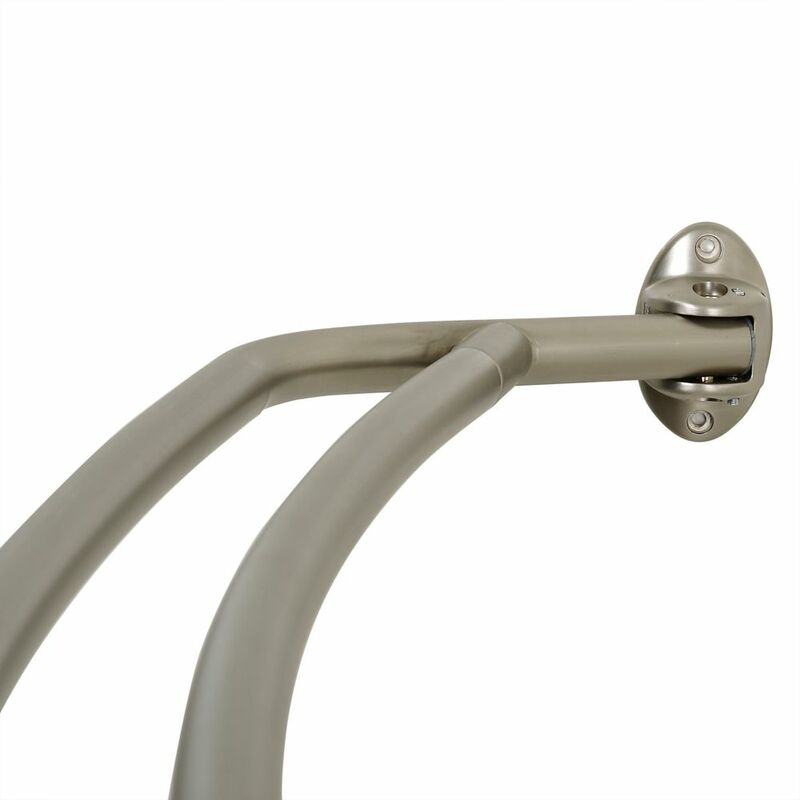 72-inch Aluminum Double Adjustable Curved Shower Rod in Satin Nickel is rated 4.3 out of 5 by 48.